Welcome to my blog/benvenuto nel mio blog! My name is Cristina and I’m passionate about art and Italian culture. I was born in Orsara di Puglia, Italy, and immigrated to Canada with my parents when I was a young child. I love spending time in Italy, including Orsara, every year. In this blog, you will find all the things I like…..art, art history, Italian travel, history, traditions, folklore, food and language….along with my photos and images. This really should be 3 or 4 different blogs, but I only have time for one, so here it is! For more about me, read my first post ‘Perché questo blog? / Why write a blog?’ and my interview by a fellow blogger L’intervista con Silvia. 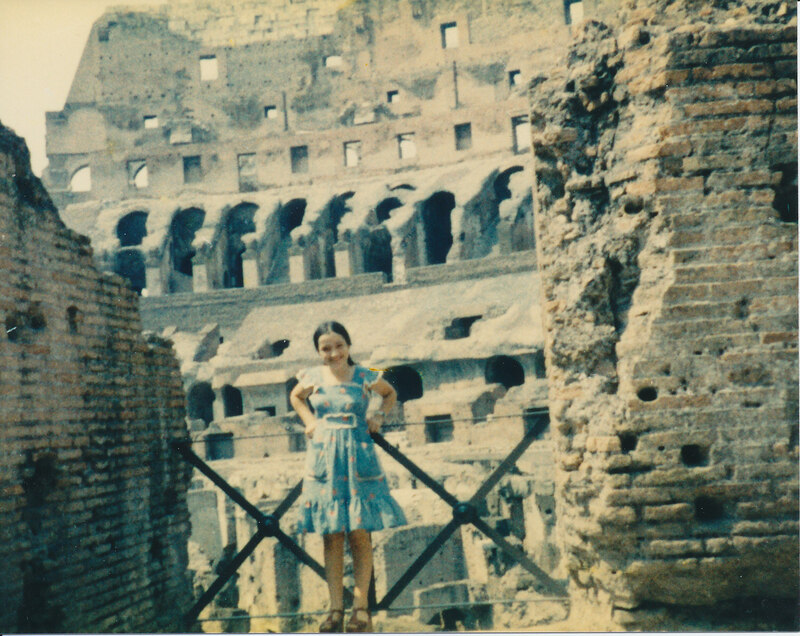 11 year old me on my first visit to Roma! Grazie Diana. It’s still a work in progress. Thanks for visiting! Cute pic! 🙂 Thanks for stopping by my blog – maybe you found me through my sis who I see commented above. 🙂 Looking forward to reading along. Ciao Lynda-yes I was actually reading one of Diana’s posts and I dropped my iPad and must have hit your link. I picked it up to find those wonderful photos of bambini playing in the desert! Oh how funny! I hope your ipad survived unscathed! Cristina, I met you in 2009 at Peppe Zullo’s . Both sets of my grandparents were born in Orsara di Puglia and I have been bringing customers from my restaurant to visit that beautiful little town and Puglia. We are fortunate to stay with Peppe although my family would love for me to stay with them, it makes it difficult when you bring a group of people. I just discovered your blog and love it. Hi Cristina! Piacere di conoscerti. Congrats on your beautiful blog! Thanks for helping preserve the Italian culture! You deserve a “Cannolo Award” as an Authentic Italian Food Blogger. I’ve already added you to the list! And I’ll tweet the announcement in a few minutes. If you want to display the badge, it’ll make me really happy. But if not, I’ll be happy anyway 🙂 BTW, are you on Twitter? Cristina, are you interested in being my guest in my podcast? We could work together on the outline.I think it will be interesting and a lot of fun 🙂 Let me know what you think! So happy I found your blog. I just spent 12 days in beautiful Puglia!! Thank you also for commenting on my blog!! My lovely, lovely pomegranate arrived yesterday!!! Thank you so much! Grazie Vikas, you made my day! My name’s Molly and I’m a journalist for Bellavita magazine – an Italian food magazine based in London. We love your blog and we’d love to get in touch with you about featuring you in our magazine – do you have an email we can contact you with? Just discovered your blog after you left a comment on mine, and I’m looking forward to exploring. Puglia is a region that holds special sentimental value for me, since my paternal grandfather came from a small town outside of Bari (Grumo Appula). But truth be told, I know relatively little about the region—so I’m looking forward to letting you be my guide. Would love to get your thoughts on Puglia. If we are only spending a week there, is there an ideal base for the week or are we better off doing 2-3 days in a couple of different spots? I found your blog about Italy and I wondered whether you would be interested in having a look at my about to be published “Living in Italy: the Real Deal – How to survive the Good Life”. The creative non-fiction book contains sixty short stories about my adventures as a Dutch expat who moved to Italy in 2008 to start a bed and breakfast. It is the translation of the Dutch original that met with considerable success (sold 3000 copies) and had very positive readers’ reviews. It is published through Babelcube and contains 280 pages, 67.000 words. Stef Smulders was born in The Netherlands in 1960 and moved with husband Nico and their dog to Italy in 2008 to start bed-and-breakfast Villa I Due Padroni in the beautiful wine region Oltrepò Pavese south of Milan. In 2014 he published his first volume of short, anecdotical stories (in Dutch) about daily life among the Italians entitled “Italiaanse Toestanden”. It was well received by readers, leading to a second volume of witty anecdotes. A third volume is to be published spring 2017. I could send you the epub or pdf if you want to. I’ve come across your blog and it is great, I love how you seamlessly change from Italian to English and vice versa! I went to Puglia once – Bari and Alberobello. I was amazing how white and exotic Bari felt. If you fancy escaping to the Veneto region, say hello 🙂 I’ve had the joy to try gnocchi di zucca too!